"The Northern conference to bring together sports, fitness & education professionals & students, & all those interested in the movement. Founded by Kate Hardcastle". Buttercrumble partnered with Women in Sport Conference North to celebrate amazing talent in the sporting industry. Together, Chloe and Abigail (the twins behind Buttercrumble) live streamed the event through live illustration at BBC MediaCityUK. This encouraged engagement through social media amongst guests and those around the globe. Buttercrumble illustrated portraits of the panellists live. The illustrations were inspired by courtroom sketches, but with a dynamic twist. The use of bright colours and swashes added energy for this sporty event. Each illustration was completed within 10 minutes in order to keep up with the pace of the talks. During the event, the illustrations were shared to the official @ConfSport Twitter feed with the conference's hashtag. There is a unique value in entertaining guests, bloggers or VIPs through live illustration. It helped to document the event whilst promoting a worthy cause. It even enabled the hashtag to trend! Brands are increasingly expected to surprise and delight audiences through exciting experiences rather than traditional advertising methods. Visual note-taking promoted this worthy cause in an exciting and engaging way. 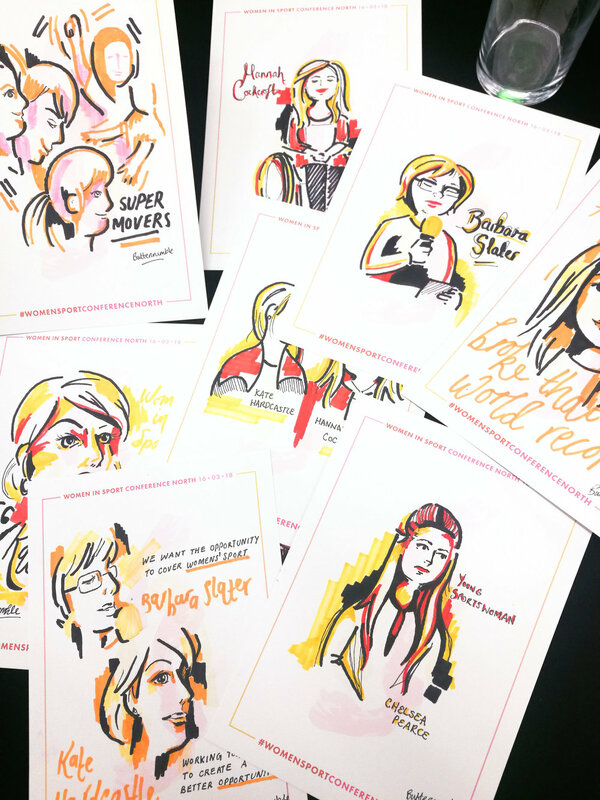 We collaborated with Women in Sport Conference North to produce a style of illustration that was in-keeping with their brand as well as incorporating the hashtag seamlessly within the visuals.